The Latitudes - Delia Power Reclining Sectional Sofa with Armless Recliner by Flexsteel at AHFA in the area. Product availability may vary. Contact us for the most current availability on this product. 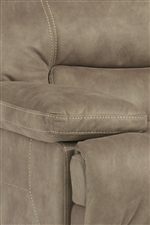 1458-59P Armless Recliner w/ power 1 32" 40" 38"